In addition to everything else, the KDE Panel itself can be configured. There are a good number of items that can be configured for the KDE Panel. 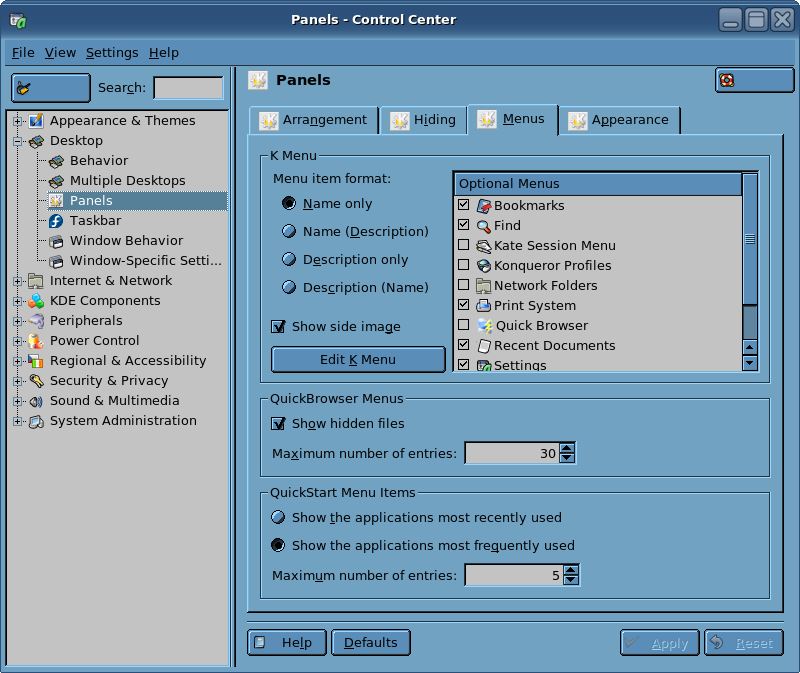 Figure 38: The KDE Panel Can be configured with this page of the Control Center. Each tab contains additional items to be configured. The Arrangement tab allows you to specify the location of the KDE Panel around the perimeter of the screen, its length as a percentage of the screen width (or height if the position is on the side of the screen in a vertical orientation), and the size (how tall) the Panel is in pixels. Note that I have a custom setting for the Panel’s size but the selection box also has options for tiny, small, medium and large sizes. You can place the Panel in any of twelve base locations on the screen and in horizontal and vertical orientations. All you need to do to select a position and orientation is to click on the respective button. Try it now and see how looks in various locations. If you have very few icons and buttons on the KDE Panel, the length option can be set so that the Panel does not extend the entire width or height of the screen. Even if you choose a small number for length, the panel will expand to fill the minimum size needed to contain all of the icons and buttons you add to it. The Length setting is really more of a “minimum Length” setting. The Hiding tab of the Control Center Panels page is used to define the hiding behavior of the KDE Panel. It can be hidden automatically or manually by clicking on one of the hiding buttons. The default setup for hiding the KDE Panel is for manual mode. Since no hiding buttons are activated you cannot hide the Panel until you configure this tab. I do not personally like the automatic hide options so I just activate both the left and right Hiding Buttons in the Panel Hiding Buttons box of the Hiding tab. When the Apply button is clicked, a hiding button is added to each end of the Panel. Figure 39: Use the Hiding tab to configure the hiding behavior of the KDE Panel. Just click on one of the Hiding Buttons to hide the panel. The Panel slides into the side of the screen in the direction the Hiding Button arrow is pointing leaving only the hiding button on the opposite end of the Panel displayed so that you can unhide the Panel. If your preferences differ from mine, you can configure the automatic hiding options for the Panel. You can set the timeout for automatic hiding. You can also specify whether applications are allowed to cover the Panel and whether the Panel is to be made visible when switching desktops. The Panel Animation Hiding section allows you to turn animation on or off for when the Panel is hidden or unhidden. It also allows you to use the slider to determine how fast the animation takes place. I usually leave these settings at the default. Figure 40: The Menu Tab of the Panel page of the KDE Control Center allows you to configure the KDE Menu. The Menus Tab of the Control Center Panels page allows you to determine the contents and format of the KDE Menu which, as you remember, is available via the KDE Panel. You can add or delete items here to make the KDE Panel Menu as complete or as spare as you like. If there are menu items here that you would never use, you can delete them. You should be careful, however, not to delete menu items that you use frequently. The menu items over which you have control are not the programs and utilities, but rather are the tools that make access to some things easier and quicker. Things like bookmarks, network folders, the Print System menu, and a list of recent documents can be added to or removed from the KDE Panel Menu. The top section of this tab contains a list of menu items with check boxes that allows you to specify which items appear in the KDE Panel Menu. You can also configure whether the item name and/or description is displayed in the menu. The Show side image check box determines whether a narrow graphic is displayed along the left side of the KDE Panel Menu when it is opened. The center section of this tab specifies whether you can see hidden files in the Quick Browser. The Quick Browser is a menu based method for navigating your file system. It does not allow you to manipulate individual files, only to open a terminal session within a folder (directory) or to launch a file manager within the chosen folder, specifically Konqueror, which I cover in great detail in Chapter 3, in order to manipulate files or folders in that directory. Hidden files are not really hidden. They are named with a prepended period (.) and by convention, are not usually displayed. If you check the Show hidden files check box, these hidden files will be shown in addition to non-hidden files when you use the Quick Browser. The Quick Browser itself is a way to view and access files by using the KDE Panel Menu. I find this rather cumbersome most of the time and so I do not even display the Quick Browser in my menu, opting for using Konqueror which I cover in Chapter 3. However, if you do choose to use the Quick Browser, Figure 41 gives you an idea what navigating your file system is like when using this tool. Many people do find the Quick Browser useful and you may also. As I said, I find it cumbersome and not worth the trouble.